BETHPAGE, N.Y., July 20, 2011 -- On the 42nd anniversary of Apollo 11 Commander Neil A. Armstrong's first steps on the moon's surface, Institute of Electrical and Electronics Engineers (IEEE), the world's largest technical professional association, today honored Northrop Grumman (NYSE:NOC) with its IEEE Milestone in Electrical Engineering and Computing award in recognition of the company's work on the lunar module. The Apollo lunar module, America's first vehicle to enable astronauts to land on the moon and return safely to earth, was designed, developed and built by Grumman Corporation on Long Island. Between 1969 and 1972, six Grumman lunar modules carried 12 astronauts to and from the surface of the moon, including the famed Eagle which first carried Commander Armstrong and Lunar Module Pilot Edwin "Buzz" Aldrin to the Sea of Tranquility. They returned to Earth on July 24, 1969. One module â Aquarius â served as a lifeboat for three astronauts, Jim Lovell, Jack Swigert and Fred Haise, during the ill-fated Apollo 13 mission, which never landed on the moon but returned safely to earth. 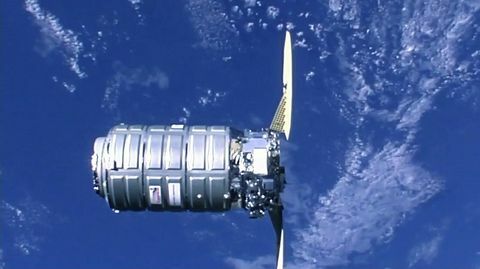 "Since the dawn of the space age, Northrop Grumman has put good ideas into orbit and beyond. From systems engineering, spacecraft manufacturing, precision sensors, space instrument design, ground stations development and orbiting space platforms, our space capabilities have transformed lofty concepts into high-flying realities for a wide variety of missions," said Pat McMahon, sector vice president and division general manager, Northrop Grumman Aerospace Systems' Battle Management and Engagement Systems. "We are deeply honored to accept this award on behalf of the tens of thousands of people who worked on this program." The IEEE Milestones in Electrical Engineering and Computing program honors significant technical achievements that occurred at least 25 years ago in technology areas associated with IEEE. This is the first Long Island Section milestone. 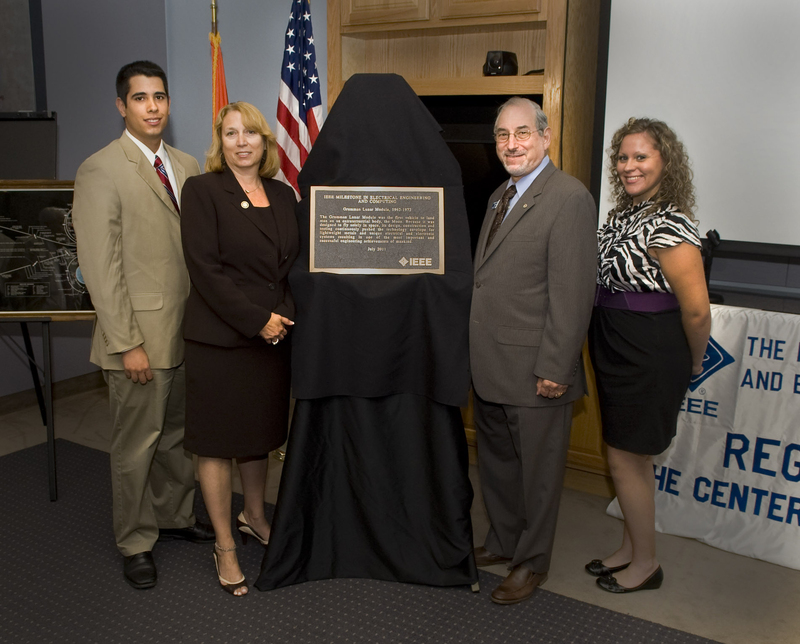 To date, more than 100 IEEE Milestones have been approved and dedicated around the world. The award cites electrical and electronic systems invented by Grumman engineers that made the Apollo flights and future space flights possible. The dedication is sponsored by the organization's Long Island Section. The Grumman Lunar Module was the first vehicle to land man on an extraterrestrial body, the Moon. Because it was designed solely to fly in space, it was made of lightweight metals and unique electrical and electronic systems. The design, construction and testing of the Grumman Lunar Module continually pushed the technology envelope and resulted in one of the most important and successful engineering achievements of mankind. Among the Grumman engineers' key electrical and electronic accomplishments were a unique environmental control system that maintained the module interior temperature between 65 and 70 F, and a robust landing radar and computer system that measured the delay between the transmitted and reflected microwaves from the lunar surface and calculated accurately the module's proximity to the lunar surface. The Grumman Lunar Module's ascent stage's radar antenna also received transmissions from the Command Surface Module's transponder and calculated the Grumman Lunar Module's precise position and speed during docking. The guidance computer used on the Grumman Lunar Module was the first computer to use integrated circuits in its design. Northrop Grumman's Information Systems and Aerospace Systems sectors were formerly part of TRW, which developed the lunar excursion module descent engine (LEMDE) for the Apollo missions. TRW also provided critical software for mission analysis and simulation, guidance and trajectory control, an abort guidance control, and a backup communications system. Northrop Grumman's Baltimore-based Electronic Systems sector, then the defense and electronics business of Westinghouse, manufactured the camera used to broadcast the now famous images from the lunar surface to earth. Two other companies that are now part of Northrop Grumman also made significant contributions to the mission. Dalmo-Victor designed and supplied the S-band 2-Gigahertz high-gain antennas that made possible the transmission of the live images from the moon's surface. Amecom Division of Litton Systems, Inc. produced flush-mounted antennas that transmitted and received all S-band signals during near-Earth operation and served as backup for the high-gain antenna in deep space. Four antennas were mounted on the command module. Northrop Corporation provided the earth landing system that included the space vehicle recovery parachutes for Apollo 11. 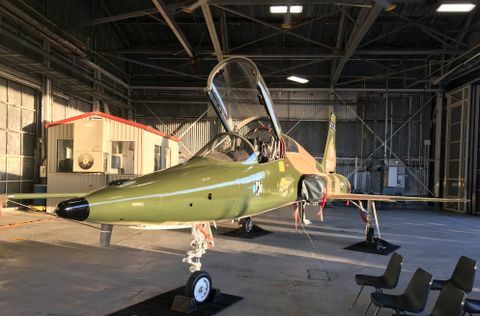 In addition, NASA has used the Northrop-built T-38A Talon jet aircraft extensively as trainers for astronauts. IEEE, the world's largest technical professional association, is dedicated to advancing technology for the benefit of humanity. Through its highly cited publications, conferences, technology standards, and professional and educational activities, IEEE is the trusted voice on a wide variety of areas ranging from aerospace systems, computers and telecommunications to biomedical engineering, electric power and consumer electronics. Learn more at www.ieee.org .